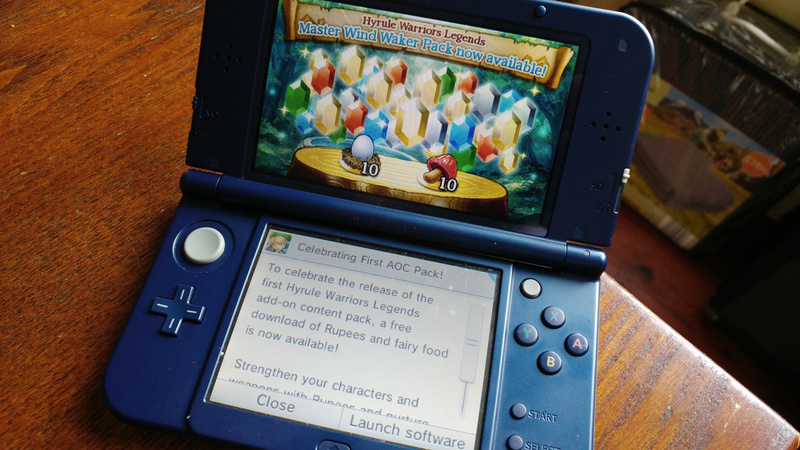 To mark the release of DLC for Hyrule Warriors Legends Nintendo is giving players free Rupees and fairy food. The download includes a whopping 500,000 Rupees, 10 Delicious Weird Eggs and 10 Delicious Odd Mushrooms. Yum. Fire up your 3DS and you should have a notification pointing you in the general direction of these treats. Will this generous offering convince you to get back into the game, or perhaps it might even influence a purchasing decision if you haven't taken the plunge already? As always, we want to know, so leave a comment below. So, question; when will the extra characters be available for the Wii U version? @smashbrolink If you're on about the Legend exclusives (Linkle, King Daphnes, Tetra, Skull Kid, Toon Link) then more than likely July at the same time as the Link's Awakening pack. If instead you're on about Medli, then today same time as the 3DS version. Just waiting on Medli for Wii U.
I'm back to playing this on Wii U. 300 hours in. My Link is now Level 200. I hope all the extra stuff is coming to Wii U, I'm not into buying this game again and starting from scratch with worse graphics. @Grumblevolcano Eh? They're all already in the Wii U version. @deKay Only if you buy the 3DS game and use the download code. Otherwise those characters will be sold separately on Wii U eShop during the Summer. @deKay Only if you buy Legends. If you don't buy Legends, you have to wait until the Legends Character Pack is released on the eshop which is this summer. Hmm... I didn't get this message. Maybe I'll get it later. @Grumblevolcano But why would you not buy Legends? I've had a bit of fatigue with Legends due to putting 200 hours into the Wii U version, and having to level up/unlock all over again. I wish there was a way to transfer such things into the 3DS one. @deKay Because I refuse to give Nintendo money for screwing over Wii U owners. Anyway, where's Medli? The eShop has updated. If it wasn't for my backlogs and still trying to "complete" the Wii U version (since launch), I would of already been on this dlc goodness. Well maybe one day they'll have the digital game on sale, then I'll have more incentive to get it sooner. @RainbowGazelle You don't download her from the eShop you have to update the game and she's there. Update doesn't take long though which is good! Wii U left out again? Just how badly does Nintendo want to kill off this system? @RainbowGazelle don't get how they screwed over wii u owners. the wii u game didn't have to get any more dlc, if this was sony or ms it would had got the dlc packs and stopped. they are being real nice just releasing any more content for the wii u build at this point tbh. @RainbowGazelle I'm not sure how it's screwing over people? The Wii U game was done, finished, complete. Then Nintendo decided to add to it as a bonus for buying the 3DS version. I don't have this game, but this looks like a great offer! @deKay @kenrulei It's the releasing the 3DS version at a lower price than the Wii U version, with more content that irritates me. Then releasing even more DLC, but only letting Wii U owners buy the characters and weapons (at an inflated price), and not the new adventure maps. It all screams "screw you if you bought it on Wii U" to me. @RainbowGazelle on the other hand... why would anyone buy the 3DS version if all the content was in the Wii U version? I was happy buying both. There's no multiplayer in the 3DS version and 100% of my time with the Wii U one is co-op so if anything - to me - the 3DS version is missing essential content, not the other way round. @deKay You're making very facile arguments. It should be obvious why it can be frustrating that the additional content for the 3DS version can't be played on the big screen on hardware that can actually run it properly. Frustration = feeling screwed over. "Otherwise why would anyone bother with the 3DS" isn't an argument for exclusive DLC as much as it is an argument against the existence of the 3DS version, and a poor one at that. Different strokes for different folks - people who prefer the 3DS version should be free to enjoy that one, and people who enjoy the U version should likewise be able to enjoy content there. Forcing both groups into the same version to get to the latest maps and storyline just causes negativity all around. For the 3DS version, you can go to the eshop and choose the update there to make Medli, the Wind Waker map and the other extras available when you start the game. @Fath "Hardware that can run it properly"? The New 3DS runs it just fine, in 3D with a higher enemy count and framerate than the Wii U version in two-player mode. As I said, I own both so aside from not being able to co-op the new stuff, I'm not fussed it isn't available on the Wii U. I'm only 140-odd hours into the Wii U version so I've a good 75% of the game left to go yet - I'm not put out by some extra content not coming over. @RainbowGazelle well it's not as impressive as the wii u game, the game has been toned down to fit on the 3ds, but by doing so the frame rate is better than the wii u game on new 3ds. the wii u game has a ton of content, they didn't even have to add more warriors in at all, you got you moneys worth on wii u in the stand alone game, never mind the dlc's after it was out. i have both for the record and still play both versions. @crzysortagamer I'm in the UK, might be different for other countries, perhaps. I chose update 1.1.3 in the eshop. It doesn't specifically mention the additions. @SKTTR You want to keep hoping that you get the LEGENDS content added, that you'll be forced to backtrack for the Ocarina, and end up with the same stuff as the 3DS Version on the Wii U? You WANT to see the My Fairy feature rendered, with the fairy character rendered in glorious 3D, instead of a plain 2D artwork, don't you? Well, you better just wait until the NX Version, which might be a PREQUEL, where Link's predecessor, also named Link, actually SEALS and separates Ganondorf's spirit in the first place, and Cia's Original form included! I'm glad to have bought the Season Pass! 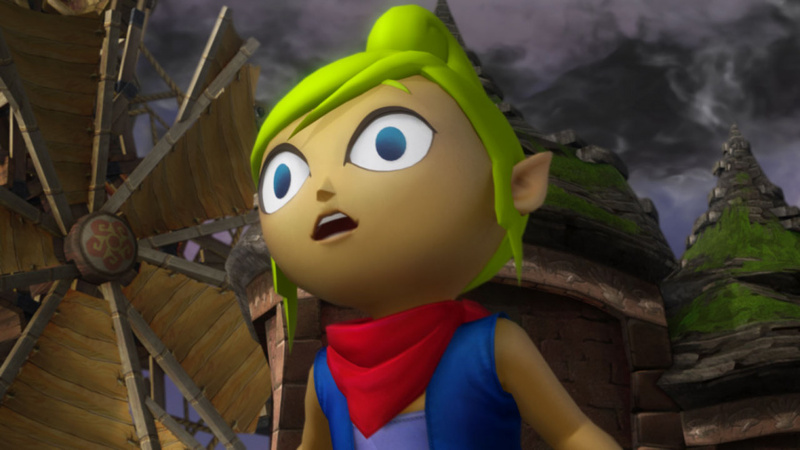 I got the Wind Waker DLC today and Medli, but not the 16 costume pieces for the fairy Mode? Or does it mean there are 16 included in the Wind Waker Adventure Map? The 3ds version has no multiplayer, no boss smash animations, and looks worse graphically. The adventure maps and bonus content is balanced in better, but balance is destroyed by "my fairy". By the way, use those shrooms to level up your fairy with a dark barrier. So broken! Better graphics cost significantly more, and since many assets are reused, they can easily afford to charge less for the 3ds version. And the switching characters along with quick warping makes the game feel fresh. My fairy makes magic soooo desirable and young link is now super broken! @kenrulei "You got your money's worth on wii u in the stand alone game." I disagree. There was barely enough in the original to be worth the base game price. Yes I concur. I could start the game from scratch on a tiny screen(even compared to just the gamepad), enjoy lesser graphics and even more slowdown and less enemies on screen. Or they could add these features to the game that sold reasonably for the wii u install base and please fans. I think I will wait and see if they try to please fans. @deKay If you're not put off by the 3DS graphics, then fair enough - like I said, to each his own. I trust that you can see how some people might feel otherwise, though, and for those people, not being able to play the new content - excessive or not - on their platform of choice is a legit grievance. @Fath I'd like to be able to play the new Twilight Princess HD content on my Gamecube version, but that isn't going to happen. It's a new version of the game, with new content. 90% of it is the same, yes, but that doesn't mean they should backport all the new stuff. They've already done more than they really needed with the extra characters! @RainbowGazelle "not enough content"? There's easily 200+ hours of content there. How much do you want?! @alasdair91 You have to unlock the costume pieces on the Master Wind Waker Map. I was fortunate to be able to put Medli in the 50s when she came out. @deKay 200+ hours grinding the same few maps over and over again. Totally pointless. @RainbowGazelle In your opinion. I've had so much fun with it. And adventure mode isn't grinding anyway. Same maps, sure, but different objectives and rules. It's like complaining that FIFA only comes with a handful of pitches. @deKay "In your opinion." Well done, that's what comments are for. I understand what you say about why would people buy the 3DS version if Wii U got everything too, but it still feels rotten to the buyers of the original game to me. So how do you get the rupees and food then anyway? Oh, never mind - check for spot pass data in the settings did it. Is it possible to get the fairies if you miss them? I just found out they gave one out last week but I missed my chance.